There aren’t many better things than a delicious homemade dessert. 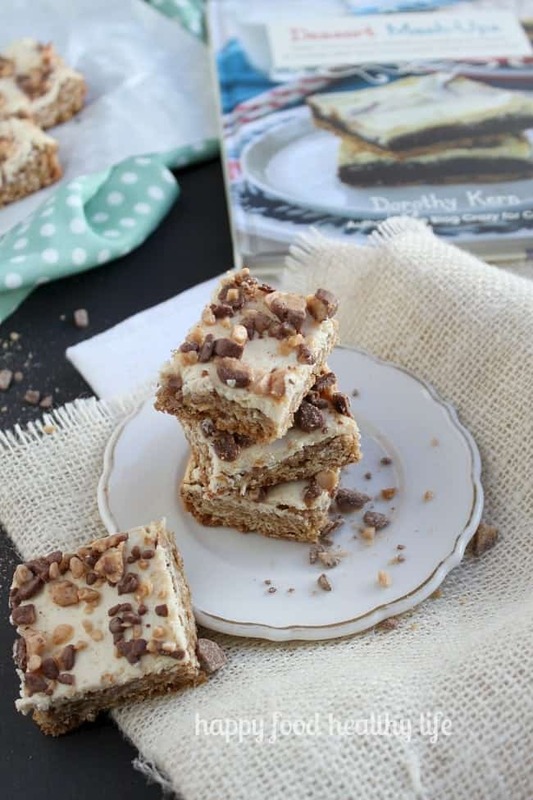 Well, unless you get a two-in-one dessert like these Oatmeal Cookie Cheesecake Bars from the new cookbook, Dessert Mash-ups, by Dorothy Kern of Crazy for Crust. One of my favorite things about being a blogger is having food blogger friends. And let me tell you guys, I have some of the most talented food blogger friends out there. With every blog post I come upon, I’m adding a new recipe to my Dinner Yum-Yum or Dessert that I Want in my Belly Pinterest Boards. On top of that, I’m seeing brand new cookbooks being published by all my friends every time I turn a webpage corner. So there’s no doubt that I am surrounded by quite the talented bunch. I am so fortunate to have had the opportunity to try out my dear friend Dorothy’s new cookbook, Dessert Mash-ups. You know what a dessert mashup is, right? Basically you get two-fers the whole way through! Cookies mashed with pies. Pies mashed with cupcakes. Cheesecake mashed into dip and shaped to look like a football?! Holy creative mashing here! I first met Dorothy virtually at Online Blog Con in 2012, the conference that truly changed my blogging career. As if her desserts weren’t enough, but her business know-how and expertise really impressed me. Over the years we became closer, and she came to me for advice on how to share her struggles with food and body image on her blog, and luckily, we finally got to meet last February at Build Your Blog Conference here in Salt Lake City. Blogging friends truly are the best. You may not think that you can create an everlasting friendship through the internet, but let me tell you – that’s where some of my best friendships have started! As soon as I received Dorothy’s book in the mail, I started flipping through the pages and had the hardest time figuring out which one I was going to make first. Everything looked so dang good. I was comforted with the fact that I would essentially be getting two treats in one. And with a potluck coming up at work, I knew I would be making something super delicious from the book to take. 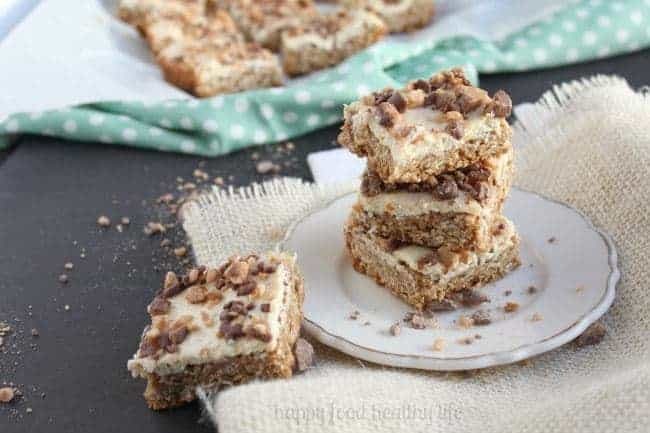 After about 3 hours of of thought and consideration, it was apparent that these Oatmeal Cookie Cheesecake Bars would not get out of my head. I love oatmeal cookies. Like a lot. Like more than pretty much any other cookie. On top of that, of course there’s the cheesecake, but then on top of THAT is another one of my all time favorite things in all the history of things…. TOFFEE! These are covered in toffee! Totally sealed the deal for me. ……..had to take a break to go eat one of these…………. There’s really not a whole lot more to say about these bars. All I know is that if everything else in Dorothy’s book tastes even HALF as good as these bars, my co-workers and I are in trouble and better start an extensive workout program on our lunch breaks. And I’m so lucky that I get to share one of the amazing recipes from Dessert Mash-Ups, and on top of that, I get to give one of you a copy of this book!!! So dang awesome! And if you just can’t wait to find out if you’re a winner, please do yourself a favor and buy the book over on Amazon! And then if you win, you’re going to have an awesome cookbook to give a lucky friend or family member for Christmas! 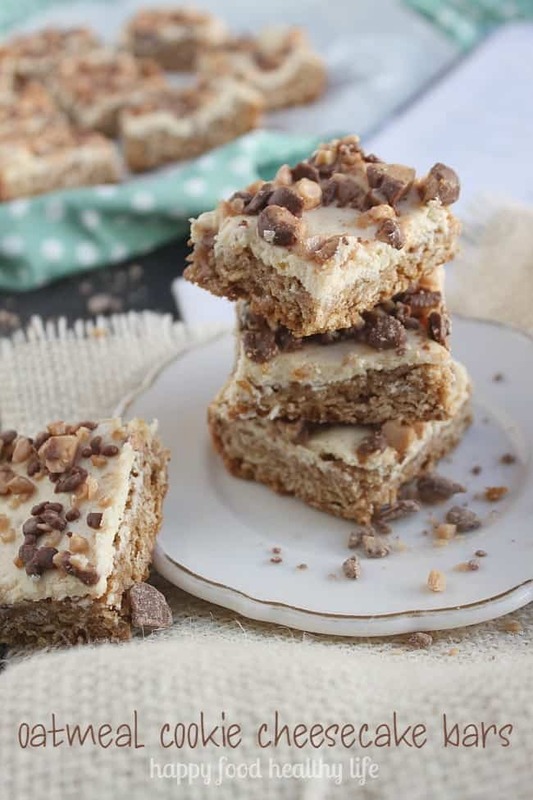 So check out these bars, hurry and enter the giveaway, and get your tail in the kitchen to bake up these beauties for your next get-together. Preheat the oven to 350 degrees F. Spray a 9x13 inch pan with cooking spray. In a bowl of a stand mixer fitted with the paddle attachment, cream together the butter, brown sugar, and granulated sugar on low speed. Beat in the egg and vanilla. Mix in the baking soda, salt, and cinnamon. Slowly beat in the flour. Mix in the oats. Press the dough into the prepared pan in a thin layer. The dough will be sticky, so spray your hands with cooking spray first. Wash and dry the mixer bowl and paddle attachment. beat the cream cheese and sour cream together until smooth. Mix in the sugar, vanilla, and egg and beat until smooth. Some lumps may remain, and that is ok. Pour and spread over the cookie layer. Bake for 25 to 30 minutes until the top bounces back to a light touch. Immediately after removing from the oven, sprinkle the toffee bits evenly across the top of the bars. Let cool completely in pan before cutting into bars. Store in the refrigerator in a sealed container. brownies or something chocolatey and gooey! How do you pick a favorite dessert? That’s like picking your favorite cookbook! My favorite dessert has to have chocolate! some kind of fresh fruit crisp w/ ice cream on top! That is the toughest question of all time! ALL of them. anything with chocolate and without coconut. That’s a very hard question! But I would say apple pie. My favorite dessert is cheeescake! I just got Dorothy’s book in the mail yesterday! Right before I had to leave town 🙁 I’ll have to drool over your photos in my hotel room instead! Such a good choice! Oh and my favorite dessert is chocolate chip cookies. Cheesecake and brownies…I couldn’t just pick one!! These sound so yummy! Thank you for linking up to Party Time and we hope to see you again next week! I adore homemade Key Lime Pie. I also have a wonderful pumpkin bundt cake recipe for the fall. 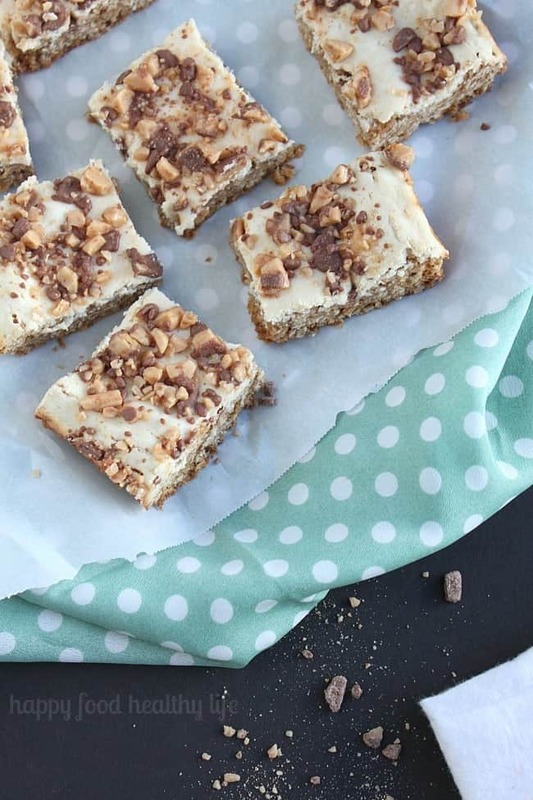 Now I’k thinking Oatmeal Cookie Cheesecake Bars might be my favorite desert……. My all time favorite dessert is cheesecake. It was one of the first things I taught myself how to bake. It’s so good and there are endless possibilities with it. 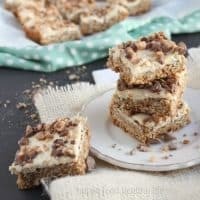 These bars look amazing!! 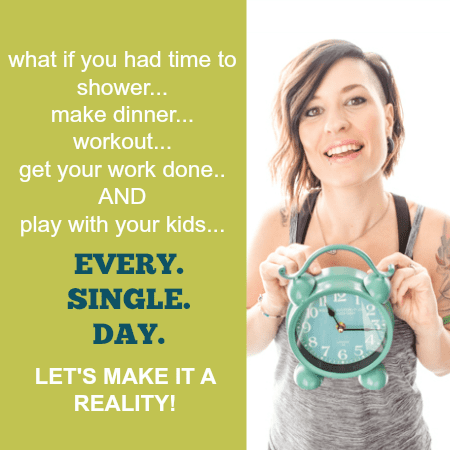 Glad you were able to link up on last week’s “Inspired By Me Mondays”; please come & link up some more posts on this week’s (Monday to Friday) http://www.parentingandhomeschoolinginfaith.com We’d love to have you!! Thank you so much Mandee!